You are here: Wade Thomas Parents Association > Programs > All Posts > Featured > Wade Thomas Book Fair April 1-5!! It’s that time of the year again! 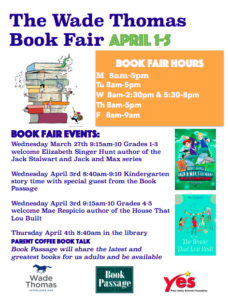 The Wade Thomas Book Fair is next week, April 1-5. All proceeds from the book fair go to the YES Ross Valley Schools Foundation.